Carotid arteries occur when the main blood vessels to the brain develop a buildup of plaque caused by atherosclerosis, or hardening of the arteries. When the buildup becomes very severe, it can cause a stroke. A stroke occurs when part of the brain is damaged by these vascular problems; in fact, 80 percent of strokes are “ischemic strokes” where part of the circulation to the brain is cut off, usually due to blockages in the carotid arteries. The process is similar to the buildup of plaque in arteries in the heart that causes heart attacks. Strokes are the third leading cause of death in the U.S. according to the National Center for Health Statistics. 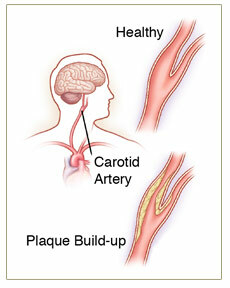 For more information on preventing Carotid Artery Disease, click here for a printable PDF.